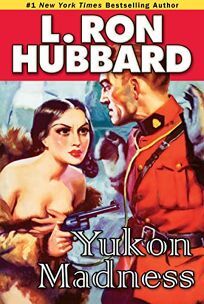 Hubbard fans will welcome this collection of three Golden Age adventure tales: the over-the-top ""Yukon Madness,"" the grim revenge drama ""The Cossack,"" and the macho smackdown ""The Small Boss of Nunaloha."" Today&apos;s readers will best appreciate ""The Cossack,"" in which Lt. Mertz Komroff contends with the imperious duchess of Novgrod. Shocking consequences follow when Komroff, who refuses to be unfaithful to his fiancée, rebuffs the duchess&apos;s advances. ""Yukon Madness"" features Itauk the Madman, who with his 12-wolf team delights in ""spreading death with sharp steel and throwing the shattered bodies of men to his slavering team."" Tommy McKenna of the Royal Canadian Mounted Police, in his effort to stop Itauk, turns to Kaja, Itauk&apos;s battered, half-white girlfriend, for more than help. Less successful is ""The Small Boss of Nunaloha,"" an action tale about Jim Lanridge, a trading company representative who&apos;s obsessed with being top dog on the island of Nunaloha, no matter what.